Many moths are nighttime feeders, but beautiful ermine moths feed during the day. With the arrival of pumpkin patches and the Halloween season, it’s time to have an episode or two featuring bugs in orange and black. This week we meet the fascinating ermine moth, Atteva aurea, and its larva, known as ailanthus webworm, a southern gal who made her way north with the arrival of a host plant from a foreign land. Inside silken webs, snaky ailanthus webworm caterpillars consume leaves of ailanthus. Some of you may be familiar with Betty Smith’s wonderful tale “A Tree Grows in Brooklyn.” This novel chronicles a young girl’s triumph over childhood hardships and poverty in a Brooklyn neighborhood. The tree that grows in Brooklyn is the irrepressible Tree of Heaven, Ailanthus altissima. This stalwart thrives in the most dismal of urban environments and in Smith’s novel it serves as a metaphor for the girl’s resilience in the face of adversity as she survives the tribulations of childhood. Tree of Heaven hails from Asia, but was introduced in the U.S. in 1784 to a garden in Philadelphia. It now ranges throughout much of the U.S. and southern Canada. Tree of Heaven is reviled as an invasive species throughout much of its range due to its hardy ability to thrive in the worst of sites and displace native vegetation. In addition to being host of a drop-dead gorgeous giant silk moth, the Cynthia moth (see the related Royal walnut moth), its leaves and seeds serve as food for nefarious invasive species including spotted lanternfly and brown marmorated stink bugs we met in previous episodes. Ugly nests at the tips of Tree of Heaven branches are the hallmark of ailanthus webworm. What does this segue have to do with ailanthus webworm? Here’s the story. Ranging from the rainforests in northern Costa Rica to Texas and Florida are trees in the plant family known as Simaroubaceae. In the wilds of Florida, glossy leaves of beautiful native Paradise trees serve as a food source for ailanthus webworm caterpillars. It happens that Tree of Heaven is also a member of the Simaroubaceae. When Tree of Heaven gained its Philadelphia freedom and moved south and west, it established in areas already hosting other members of the Simaroubaceae. Ailanthus webworm took a liking to Tree of Heaven and added ailanthus to its carte du jour. 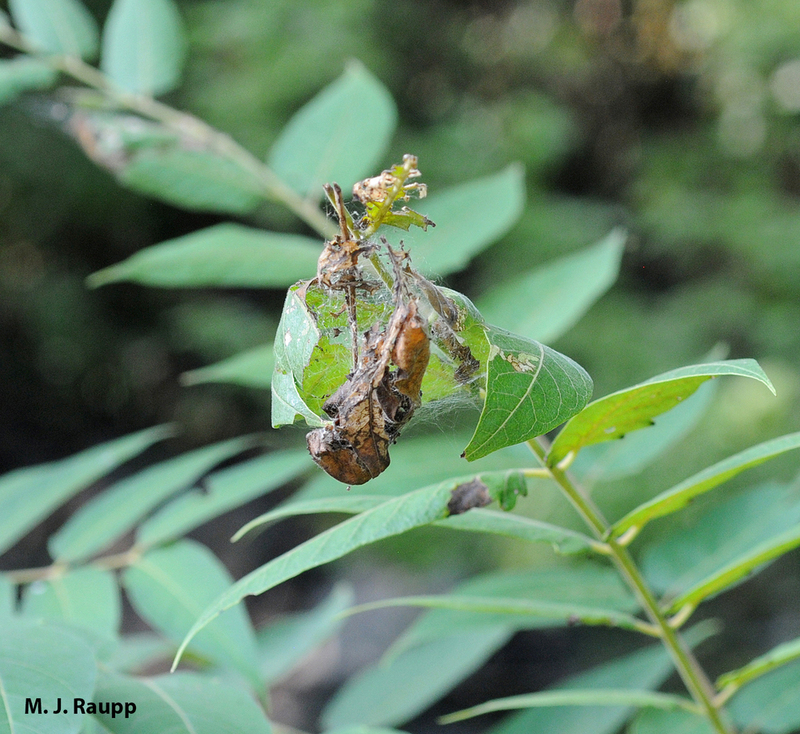 Tree of Heaven now serves as fine dining for these snaky caterpillars that build silken webs on leaves of ailanthus in late summer and early autumn. At the forest edge, Jerusalem artichoke provides energy rich nectar for ermine moths. In previous episodes we met spring feeding caterpillars like eastern tent caterpillars and fall cankerworms that feast on the tender leaves of trees in spring, and I wondered why ailanthus webworms appeared so late in the temperate growing season. Apparently ailanthus webworm favors a southern climate and winters in Maryland are just a bit too chilly to support its survival. Like the monarch butterflies, milkweed bugs, and fritillary butterflies we’ve met before, the adult stage of ailanthus webworms, magnificent ermine moths, are vagabonds. Each year they migrate from winter redoubts in the south to reach Tree of Heaven in northern states on which to lay eggs. This migration brings them to Maryland and points north in the latter days of summer. Some folks hold hope that our native webworm may decimate Tree of Heaven, but most of the battles seem to take place on smaller trees late in the season and these skirmishes seem to do little to thwart hearty ailanthus. Nonetheless, the appearance of brilliant ermine moths dressed in white, orange and black busily pollinating sunny composites in the meadows, forest edges, and the garden always brightens one’s day. The interesting article, “A review of the New World Atteva Walker moths (Yponomeutidae, Attevinae)” by Vitor O. Becker, was used as a reference for this episode.